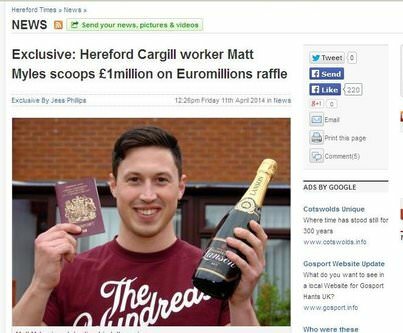 Matt Myles, a former Cargill worker has won a £1 Million prize on the Euromillions raffle. And he really was working as an engineer till he won £1million, after which he immediately resigned. Myles admits that he does not usually play the lottery, but decided to purchase a Euromillions ticket, just in case luck smiles on him. He did not win any prizes in the regular draw, his numbers not matching any of those drawn. However, when he checked the numbers for the raffle he was shocked to learn he had won. He called up a friend he knew to be awake at that late hour to help verify – then started waking up the whole family. Now he and his brother are on the way to Indonesia on the first leg of a lengthy world tour. His dad cautioned him about the money, so he plans to keep about 80% of his winnings in the bank so he can live off the interest.